Last year I went to the county fair with a handful of friends. One of these friends carried his smart-phone with him the whole time and used it to take photos. Sure, he wanted to remember the experience I thought. But then, about every 10 minutes he would stop right there, mid-step and start typing away on his smartphone. After about the third or fourth time of this I finally asked “Hey man, what are you doing?” “Updating my Facebook, he said.” So every 10 minutes he would do this, snap a photo and then take another few minutes to upload it to Facebook and write a few comments. I couldn’t help but think how strange this was: Here we are at the county fair in real life with real people and this guy had his mind stuck on the internet with virtual photos and friends who were miles away. It was almost as if he wasn’t even there with us. Sometimes trying to hard to hang on to something – such as capturing an event or an experience with a photo can make you miss out on that thing in the first place. There is a time to reflect, there is a time to act, and there is a time to just be. The Transfiguration of Christ is a time to just be – a lesson Peter learned the hard way. The season of Epiphany (which means a revelation from God) comes to a close this Sunday with the ultimate Epiphany, or we might better understand it as a Christophany – a revelation of the person of Christ. Jesus, as was his common practice, retreated to the mountains again. This time he did not go alone. Instead he took some disciples from his inner circle along with them. Our Gospel does not tell us the purpose of the trip; perhaps it was to pray, perhaps it was for a spiritual retreat, perhaps it was further preparation for the crucifixion of Christ which Jesus has already foretold. One thing seems to be certain however – that this transfiguration was an unexpected event. One in which the divine broke into earthly places. 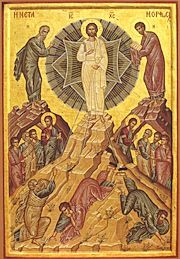 There on the mountaintop; suddenly, unexpectedly Christ’s appearance changed to a dazzlingly white and company from heaven joined the ordinary disciples. It did not take long for Peter to realize the significance of what was happening, what he saw with his own two eyes. And then he opens his mouth. “Lord, it is good for us to be here. If you wish, I will put up three shelters – one for you, one for Moses and one for Elijah.” Okay, so Peter gets credit for realizing the significance of the event before his eyes but he ruined it by speaking. Peter, why couldn’t you just be there in the moment? Why did you feel the need to try to preserve the scene by offering to build shelters? Isn’t it interesting how in trying to preserve something it can slip right through your fingers? I know that I will not being video taping my daughter’s first steps. I am going to enjoy them, experience them, I plan to just live in the joy of that moment. Grandparents are going to get a video of Penny’s second steps. It is not just his words, but what Peter hoped to do that certainly didn’t help him live in the moment. He offered to do something; he said “I will build three shelters for you guys.” Typical men – always trying to fix things; can’t you ever just listen? That word for shelter is used throughout scripture, and you may know it as “Tabernacle.” The tabernacle was a place where God’s spirit dwelled, it was a meeting place for the holy, a place set apart. It seemed that Peter just didn’t get it; he wanted to build a place for meeting the holy when the holy was right there in front of his face! Words just seem to fall short when trying to describe these transcendent experiences of the holy. The question came up during my ordination review “When have you experienced Go?” And I hesitated and stumbled about the question. It’s not that I have never had such spiritual experiences; but they are just so hard to pin down with words. A hike through the woods at college on my own, on the beach with an incoming thunderstorm, talking to someone who had not yet heard about the love of God; these are some of my mountain top experiences which are so difficult to contain and explain. As human beings it is natural to want to capture moments that are deep and meaningful to us – our mountaintop experiences. People often dread coming down from that mountain; but I believe there is certainly opportunity for us to “listen to him,” to be with Christ even in the valley’s of life. As we approach this Lenten season, I encourage you to find those quite moments – not for words and action but to simply be with your Lord. And perhaps Ash Wednesday is a day to try this practice. I encourage you to find some time to simply be with God, sit in silence, contemplate on his wonder. No words no action. Listen to him! Be with your Lord.